She appears in one illustration in Tale of the Unnamed Engine. 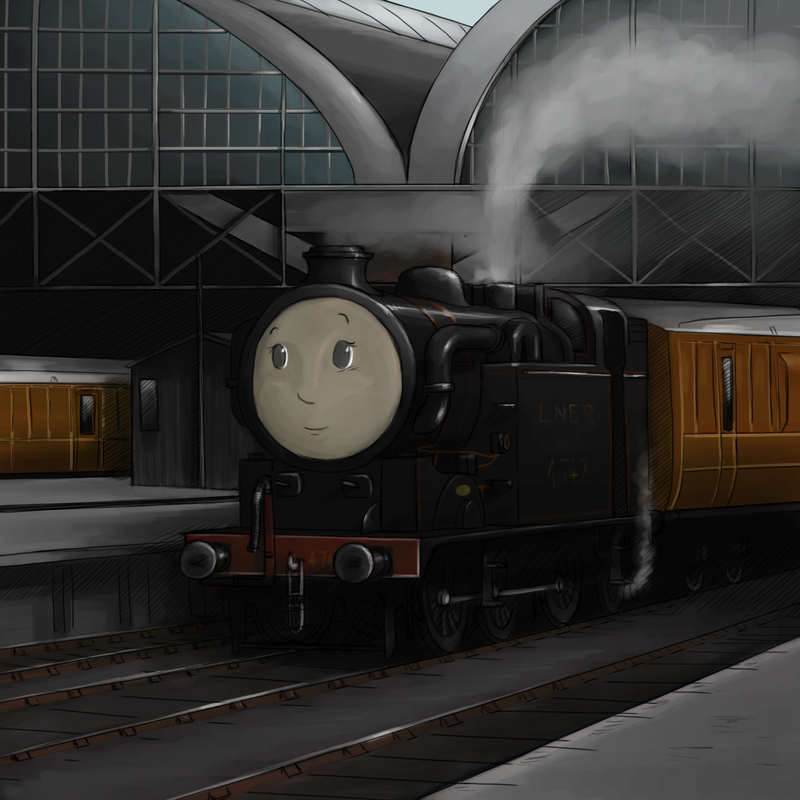 She appears on several occasions, unnamed and unspeaking, in the YouTube editions of The British Railway Stories. She even has her name mentioned in the Trainspotting section at the back of the aforementioned children's book. Violet, as I will now explain, is a character whose genesis goes back to the earliest days of The British Railway Stories. Back when it wasn't actually known as either the latter, or the earlier The British Railway Series. No, she goes back to a time when there wasn't a name for the stories, and all there was were names on a crib sheet, and vague ramblings about talking trains from the history of Britain, "real railways, real stories" underlined firmly in biro. Violet is a member of the Gresley N2 class of steam locomotives, as seen below. Rather handsome locomotive, no? This is the preserved locomotive, 1744 (later 4744) in its original Great Northern Railway livery, whilst visiting the Mid Hants Railway a few years back. Violet was named for Violet Gresley, one of Sir Nigel Gresley's daughters, and one who was frequently photographed with her father at many of his locomotive launches, particularly after the sad passing of his wife in the 1930s. The character was intended to help balance up a vague idea of a locomotive roster, which originally comprised classes A2, A4, B12 and J37 but ended up being A1, A4, B12, J39, V2, V3 and a few others…and one solitary Gresley N2 in the background on several occasions in the films. As a character, she was intended to be supportive, loving, loyal and wise (true to her namesake) and would have had more lines, were it not for the frankly awful voice acting from yours truly…can you imagine how bad that would have been?! Fear not however. Violet, along with a whole host of new and returning characters, will appear next in Gresley's Goliaths…which is shaping up to be something special and more of which will be written on it during 2014. 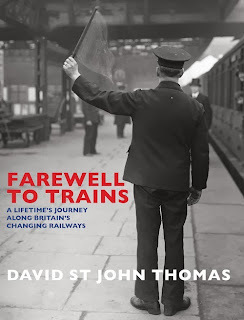 I was delighted to be approached by an employee of Frances Lincoln publishing to ask if I would be prepared to review David St John Thomas' latest book, Farewell to Trains. With my sincere apologies for the delay in publishing the review, which was due originally at the start of November but delayed for a few personal reasons. Well, I'm back and reading up on what is an absolutely fascinating book. The volume is a hefty piece at over 254 pages long, in a hardback edition of 284 x 216mm size. The book itself is made up of extracts and anecdotes from over 65 years of writings on railways, mostly concerned with the areas made up by the Southern and Great Western Railways. One thing which will throw a few people are the choices of photographs and images, not always necessarily directly connected to the context of the anecdote. The first few chapters give us some excellently reproduced photographs of Great Western broad gauge locomotives and their trains, but the topic of discussion is that of how we interact with, and find solace in the railways. This is not a criticism as such, on the contrary: it was refreshing to see that the images had been carefully selected, not by region necessarily or by the locomotive choice on the front, but by the scene presented. When talking about the comforts of railway travel, as an example, the asides in the text and the photographs opposite pointed out the advantages of the broad gauge as adopted by Brunel and the Great Western Railway, that is greater stability at speed. The book is littered with eloquent examples, my favourite being that of the country railway chapter, and the photograph showing horses being loaded into cattle wagons, headed for West Grinsted in a farm removal operation. The author's knowledge of the way railways work at every level, and their effect at every level to the traveller is vast, and helps the layman (and those who would believe themselves knowledgeable, at least in the field of railways) to realise the importance of the system to ordinary travellers, workers and industry. The anecdotes throughout are delightful, images are well chosen and sharp, and you get a real favour of British railways - and British Railways with a capital B R - that no one else quite gives. The book really is unique and full of life on so many levels. You really get such a sense of the enthusiasm, the delight in recounting long lost scenes to readers in extraordinary and careful detail. One feels nostalgic for a time long by despite never experiencing it one's self and therein lies another beautiful advantage of this book: you can experience it alongside St John Thomas himself though his memories and vast knowledge. Beautifully written, charming, and a book I simply could not put down. I fully endorse the excellence of this volume and would hope that readers of this blog take advantage of a very kind offer by the publishers, that is to offer a discount on the book by quoting the code given from this website. To order Farewell to Trains at the discounted price of £20.00 including p&p* (RRP: £25.00), telephone 01903 828503 or email mailorders@lbsltd.co.uk and quote the offer code APG30. Please quote the offer code APG30 and include your name and address details. I've thoroughly enjoyed the book and highly recommend it. Happy new year to all of our friends and associates, I hope the new year goes off with a bang and that 2014 is great for everyone. Now is normally to the time to reflect, but to be frank, I've done enough of that in the last three months to know nothing is going to help. Things have slowed down at BRWS Ltd quite considerably, and that was because I was working towards a mortgage with the then girlfriend, along with many other facets of a couple's life including the almost obligatory proposal and the ring to boot. Unfortunately I didn't get the outcome I wanted, and things fell apart shortly afterwards, leading indirectly to a few bits and bobs in the rest of my life being put on hold whilst I tried to sort myself out. However several of my friends HAVE got engaged over the new years, and I can say honestly that I am very happy for them, and wish them all the best. So, 2013 is over, and a new year begins. I'm going to try very hard to be a better person, and make it a good one for friends and family. Starting with writing a few new books, working hard at my job and continuing my new life with a renewed determination to succeed.